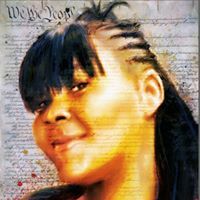 B-Mor7 (Blessed Movement & Original Rhymes Divine): artist, activist/organizer, educator, mentor, and inspiration; dedicated to Hip Hop Culture and beyond. The Human Equation: Unarmed inFraction (Fraction from the Latin fractus meaning broken and infraction as a violation or infringement of the law) is a multi-media examination of hate crime in America with a focus on lynching and extra judicial killings by individuals and police. The title is a play on words that uses math fractions and equations to break down the infractions perpetrated by vigilantes on a continuum from slavery to mass incarceration. On the 10KSouls playlist: #SayHerName and Red Record 2, a rap about Ida B. Wells. Red Record II: In Memoriam © B-Mor7, used with permission of the artist. Target Practice © B-Mor7, used with permission of the artist. I have always been an artistic/creative person as far back as I can remember. Drawing and Painting came easy for me, but after I acquired a Traumatic Brain Injury during my time in service, I lost those abilities. I thought my days of creating were over, however over the years I have managed to relearn a few things and have returned to the creative path. Art has become my therapy and my release...it helps me make sense of things. I currently hold an AAS in Graphic Design and am pursuing my Bachelor's Degree in Fine Art. I love working with just about every kind of media, but my current obsession is taking both traditional and digital mediums and "smashing" them together to create something unique. Courtesy of the artist and Marianne Boesky Gallery, New York and Aspen. ©Sanford Biggers. 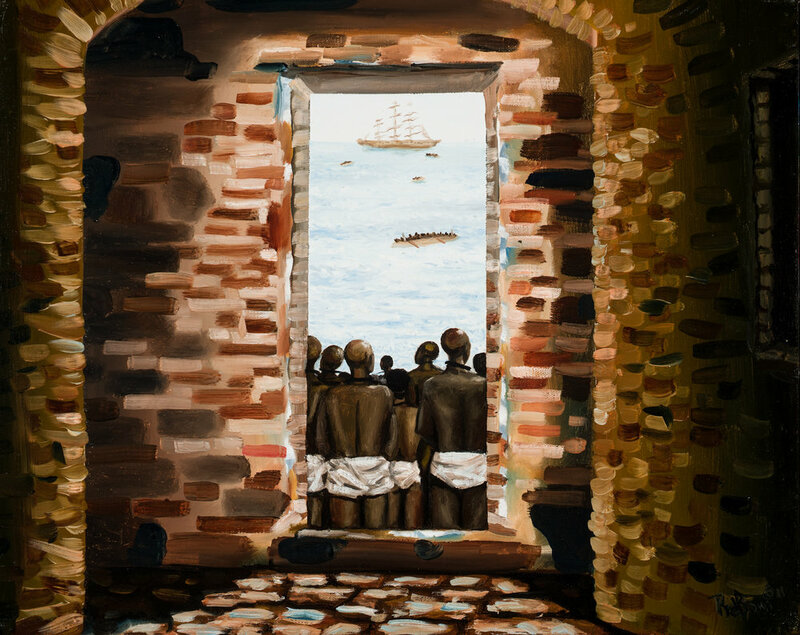 For more than 30 years, I have been painting professionally, telling the African American story from Goree Island to the American south. My artwork has been recognized internationally in print, books, film, sitcoms, and exhibits. I’m a graphic designer and multidisciplinary creative based in North London, working as Bunbury Creative since 2010. I hold a BA (Hons) in Design Studies, and have worked in a mix of in-house and agency roles for over a decade, most recently as a marketing agency Head Of Creative. I’ve provided graphic design and art direction services for agencies and businesses in entertainment, b2b, telecoms, corporate, recruitment, education, and government. I tend to specialise in projects for music and film. I work through Bunbury Creative Ltd and also work independently as an illustrator and poster artist, on commissioned and self-initiated projects in the UK and the US. Eric Garner Tribute Poster © Bunbury Creative UK, used with permission. Patrick Campbell was born in Maryland, raised in Washington DC. On October 12, 2004, Patrick suffered a stroke that left him paralyzed on his right side. As an active teen who played 4 different sports and danced, this was a hard pill to swallow. Most of all, he had been right-handed and the stroke rendered him unable to draw, or for that matter, write. By the time he was discharged from the hospital, two months after his stroke, he could draw with his left hand just as well as, if not better than, his right. He is no longer wheelchair-bound. In 2014, Patrick graduated from California College of the Arts with a B.F.A. in Illustration. He created "The New Age of Slavery" after the not-guilty verdict for the murderer of Eric Garner. It now hangs in the National Museum of African American History and Culture. New Age of Slavery, 2014. Watercolor on paper. Collection of the Smithsonian National Museum of African American History and Culture. © Patrick Campbell Art and Illustration. Max King Cap, former firefighter and advertising copywriter, is an artist whose work in various media has been seen in numerous galleries and museums in the US and Europe. He is also an educator who has, in twenty years in academia, taught most recently at Pitzer College. After earning his MFA from the University of Chicago he taught in the architecture department of the Illinois Institute of Technology and was an artist-in-residence at the Kunst Akademie Karlsruhe in Germany. He received his doctorate from the University of Southern California. 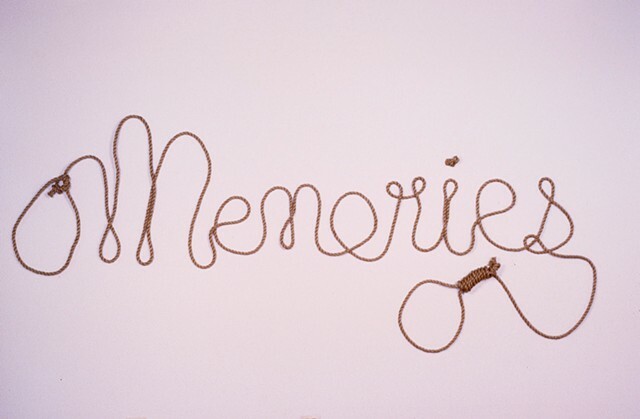 Memories - A family portrait and history lesson that references the artist's family. His maternal grandfather, Earl, who was born in Wyoming and worked as a cowboy. His great uncle, James, was lynched in Georgia after being accused of cheating at cards. The lasso, on one end, alludes to the creation myth of the United States—taming the wild west—and the noose on the other end illustrates the racial oppression that built its wealth and privilege. We Own The Night - A recreation of the crime scene where four NYPD officers murdered Amadou Diallo, firing 41 bullets at the unarmed man who was just standing in front of his apartment building. Sign © Loring Cornish, used with permission of the artist. Tree Babes © Loring Cornish, used with permission of the artist. Molly Crabapple is an artist, journalist, and author of the memoir, Drawing Blood. Called "An emblem of the way art can break out of the gilded gallery" by the New Republic, she has drawn in and reported from Guantanamo Bay, Abu Dhabi's migrant labor camps, and in Syria, Lebanon, Gaza, the West Bank, and Iraqi Kurdistan. Crabapple is a contributing editor for VICE, and has written for publications including The New York Times, Paris Review, and Vanity Fair. Her work is in the permanent collection of the Museum of Modern Art. Hands Up Don't Shoot © Molly Crabapple, used with permission of the artist. 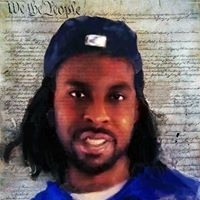 Michael Dixon is an artist working primarily with oil paint. He was born in San Diego, California, and received his MFA from the University of Colorado at Boulder. Dixon is currently an Associate Professor at Albion College, a four-year liberal arts school in Michigan. His work has been shown both nationally and internationally at museums, universities, art centers, alternative spaces, and galleries. Dixon explores the personal, societal, and aesthetic struggles of belonging to both "white" and "black" racial and cultural identities, yet simultaneously belonging fully to neither. The works of artists such as Robert Colescott, Beverly McIver, Michael Ray Charles, Glenn Ligon, and Kerry James Marshall have informed his work. Settling Down Is Hard To Do When You Are Fading Into Nothing © Michael Dixon, used with permission of the artist. Mark Dukes discovered Byzantine styled icons in his twenties after leaving art school to go on a spiritual quest. He investigated a calling to be a monk in an Eastern Orthodox monastery in Texas where he saw Byzantine styled icons for the first time. He fell in love with the form and continued to 'write' icons even after he decided that he didn't have a calling to be a monk and had left the monastery. He has been blessed to have worked on the iconographic programs of two nationally recognized churches- St. Gregory of Nysa Episcopal Church and the St. John Coltrane African Orthodox Church- both of San Francisco. Through these projects, his work has been featured in national magazines such as Vibe, The Wall Street Journal and The New York Times Magazine. © Mark Dukes, used with permission of the artist. Vanessa German is a multi-disciplinary artist based in Pittsburgh, Pennsylvania. She is the founder of Love Front Porch and the ARThouse, a community arts initiative for the children of her historic Homewood neighborhood. Her work is in private and public collections including Crystal Bridges Museum of American Art, The Progressive Art Collection, David C. Driskell Center for the Study of the Visual Arts and Culture of African Americans and the African Diaspora, Snite Museum of Art, among others. German’s fine art work has been exhibited widely, most recently at Spelman College Museum of Fine Art, Atlanta, GA; the Wadsworth Atheneum Museum of Art, Hartford, CT; the Studio Museum, Harlem, NY; the Ringling Museum of Art, Sarasota, FL; and in the traveling exhibition State of The Art: Discovering American Art Now, which originated at the Crystal Bridges Museum of American Art, Bentonville, AR. Her work has been featured on CBS Sunday Morning, NPR’s All Things Considered and in The Huffington Post, O Magazine and Essence Magazine. She is the recipient of the 2015 Louis Comfort Tiffany Foundation Grant. Resilience, 2013, Mixed-media assemblage 55 x 21 x 11 3/4 inches, © Vanessa German, courtesy of the artist and Pavel Zoubok Gallery, New York. So many many dead black bodies, or, the why niggas always gotta be shootin' when they get mad, or take your beef outside, or, the trauma stays and stays and stays, or once again, the derivative ____ makes a mockable, public spectacle of her grief, 2014, Mixed-media assemblage, 48 x 60 x 30 inches, © Vanessa German, courtesy of the artist and Pavel Zoubok Gallery, New York. Reality Check: To Call the Police Use this Phone, 2013, Mixed media assemblage 46 x 24 x 14 inches, © Vanessa German, courtesy of the artist and Pavel Zoubok Gallery, New York. Safety, Mixed media assemblage, © Vanessa German, courtesy of the artist. I create my paintings using acrylic and, sometimes, spray paint. I made the decision to pursue my art career after leaving my hometown in Chicago and moving to Washington. When I'm not painting, I work part time as a registered nurse at a local community hospital. Interactions with my patients remind me to be grateful for my health and happiness. Not Fit For a Princess, © Aramis O. Hamer, used with permission of the artist. Theodore A. Harris was born in 1966 in New York City, NY and raised in Philadelphia, PA, where his art practice is based. Harris is a collagist, poet, and has co-authored books with Amiri Baraka Our Flesh of Flames (Anvil Arts Press) and Malcolm X as Ideology (Lebow Books), with Fred Moten i ran from it and was still in it (Cusp Books),and TRIPTYCH: Text by Amiri Baraka and Jack Hirschman (Caza De Poeisa). 1999, Remember Eric Smith, © Theodore A. Harris, used with permission of the artist. Mr. Louis Head: Ferguson Police Just Executed My Unarmed Son, Sign, 2014, used with permission of Mr. Head. William H. Johnson's artistic career ended abruptly in 1947 when he was confined to Central Islip State Hospital on Long Island for a psychiatric disorder. Despondent and withdrawn, he never left the hospital or painted again. In the years before his hospitalization, he chronicled the history of African Americans. He placed his own face on the lynched cruciform figure of Nat Turner in a multi-layered image of martyrdom that illustrates the personal reality of racism. Nat Turner, 1945, oil on paperboard 31 3/8 x 25 7/8 in.Smithsonian American Art Museum, Gift of the Harmon Foundation, used with permission. Lamentation, 1944, tempera and pencil on paper 19 1/4 x 22 3/8 in. Smithsonian American Art Museum, Gift of the Harmon Foundation, used with permission. Let My People Free, 1945, oil on paperboard 38 1/4 x 30 in. Smithsonian American Art Museum, Gift of the Harmon Foundation, used with permission. Burned Out, 1943, oil on wood 32 1/2 x 26 1/2 in. Smithsonian American Art Museum, Gift of the Harmon Foundation, used with permission. 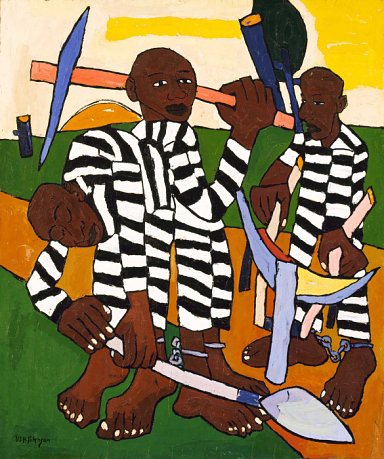 Chain Gang, 1939, oil on plywood 45 3/4 x 38 1/2 in. Smithsonian American Art Museum, Gift of the Harmon Foundation, used with permission. 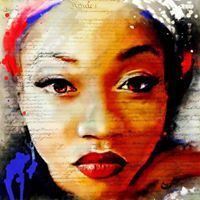 Painter, Illustrator and Author Ninety percent of my creativity is born out of who I am, how I'm not accepted and how the world perceives me. Yet, a small innate portion of my creativity was birthed in innocence, which I instinctively protect from the harshness of our society. As a social justice advocate and activist, my paintings often depict the lives of people who have been disenfranchised and marginalized. My work philosophically explores themes of racism, homophobia, and gender bias, all based on my truth. Bree Newsome and the South Carolina Nine © Adrienne La Faye, used with permission of the artist. Prison Project I © Jill LIttlewood, used with permission of the artist. Prison Project II © Jill LIttlewood, used with permission of the artist. Along with her husband, Gwen had two daughters, a son-in-law and two grandsons. Originally from High Point, North Carolina, she was a resident of Jackson, Mississippi from 1972 until her death in 2011. Requiem, 2007. © Gwendolyn A. Magee. Pieced, quilted, stitched, and appliquéd fabrics, with cording, 56" x 55". Courtesy the Estate of Gwendolyn A. Magee. Blood of the Slaughtered I, 2001. Pieced, quilted, stitched, and appliquéd fabrics, with cording. 70"x 85.5" © Gwendolyn A. Magee. Courtesy the Estate of Gwendolyn A. Magee. Blood of the Slaughered II, 2001. © Gwendolyn A. Magee. Pieced, quilted, stitched, and appliquéd fabrics, with cording. 70"x 18". Courtesy the Estate of Gwendolyn A. Magee. Southern Heritage, Southern Shame, 2001, © Gwendolyn A. Magee. Pieced, quilted, and appliquéd fabrics, with cording, 22.5"x 32.5". Courtesy the Estate of Gwendolyn A. Magee. William Henderson Moore is a painter based in the Pacific Northwest. Readergirl Sleeping © William Henderson Moore, used with permission of the artist. Death (Lynched Figure), 1934. Isamu Noguchi. Monel metal, steel, wood, rope. 88 3/4 x 31 7/8 x 22 1/8 in. Collection of The Isamu Noguchi Foundation and Garden Museum, New York. © The Isamu Noguchi Foundation and Garden Museum, New York / Artist Rights Society [ARS]. Photo by Sara Wells. Born in Snow Hill, Alabama in 1917, Noah Purifoy lived and worked most of his life in Los Angeles and Joshua Tree, California, where he died in 2004. His earliest body of sculpture, constructed out of charred debris from the 1965 Watts rebellion, was the basis for 66 Signs of Neon, the landmark 1966 group exhibition on the Watts riots that traveled throughout the country. He was a founding director of the Watts Towers Art Center. In the late 80s, Purifoy moved his practice out to the Mojave desert. He lived for the last 15 years of his life creating ten acres full of large-scale sculpture on the desert floor. Constructed entirely from junked materials, this otherworldly environment is one of California’s great art historical wonders. Hanging Tree, 1990. 52 x 40 in. © Noah Purifoy Foundation, courtesy of Noah Purifoy Foundation. Winfred Rembert is an African American artist who hand-tools and paints on leather canvases. Rembert grew up in Cuthbert, Georgia, where he spent much of his childhood laboring in the cotton fields. He was arrested during a 1960s civil rights march and described himself as the only person to survive a lynching. He heard one of the men say something about wanting "my private parts." He was stabbed and strung up by his feet in what he thinks was a scare tactic. Once he was cut down, he was tossed into jail, still bleeding. He remained there for a year until what he calls "his kangaroo court," where he was sentenced. What did he think when he heard 27 years? "I thought I was dreaming. I couldn't believe he was actually giving me 27 years, but it was true. I looked around the courtroom, and there was no one else there except the judge and the sheriff and what looked like a few lawyers, but no one there for me." The Lynching, 1999. Triptych: Dye on tooled and carved leather © Winfred Rembert, courtesy of Adelson Galleries. After the Lynching, 1999. Triptych: Dye on tooled and carved leather © Winfred Rembert, courtesy of Adelson Galleries. The Burial, 1999. Triptych: Dye on tooled and carved leather © Winfred Rembert, courtesy of Adelson Galleries. He has been written about in The New York Times, Art In America, Sculpture Magazine, ArtNews, ArtForum, Art21 Magazine, Time, The London Guardian and several other newspapers, magazines and books. He has appeared on numerous local and national TV and radio shows including Oprah, The Today Show, and CBS This Morning speaking about his work and the controversy surrounding it. He works in a range of media including performance, photography, installation, screen-printing and video. His works can be hard-edged and poignant. Dread plays with fire—metaphorically and sometimes literally—as when he burned $171 on Wall Street and encouraged those with money to burn to add theirs to the pyre. "I work in a range of media: performance, installation, video, photography, printmaking and painting. The thread that connects my work is an engagement with sharp social questions confronting humanity and a desire to push formal and conceptual boundaries as part of contributing to artistic development. My projects are presented in venues ranging from major museum galleries to street corners. Sometimes work is presented to an unexpecting audience. I bring contemporary art to a broader public and the audience is often an active element of the artwork." A Man Was Lynched By Police Yesterday © Dread Scott, Creative Commons CC BY-NC-SA 4.0. Blue Wall of Violence © Dread Scott, Creative Commons CC BY-NC-SA 4.0. As a professional artist, art educator, and community builder I work with diverse ethnic/indigenous communities which inform the content of my artwork. I use art and art education to build community and improve the lives of individuals within those diverse communities. This series of paintings and collages, Stories Behind the Postcards/Jim Crow, respond to lynching postcards that were mailed around the country during the Jim Crow era as souvenirs. Thousands upon thousands of African Americans were lynched between the 1880s and the Second World War. Over the years, I have thought about what I did not see in the postcards, primarily the family members left behind to take down the victim, to mourn and bury their remains if there was enough left to bury. The Impossible © Jennifer Scott, used with permission of the artist. My Son, My Grandson © Jennifer Scott, used with permission of the artist. Three Generations © Jennifer Scott, used with permission of the artist. I am a mother, gardener, partner, cook, writer, painter, reader, free thinker, friend to Earth. 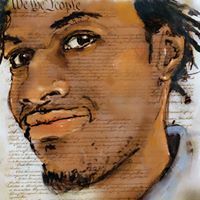 John Sims, a Detroit native, is a multi-media artist, writer and producer, creating projects spanning the areas of mathematics, art, text, performance and political-media activism. His main projects are informed by the vocabulary of mathematical structure, the politics of sacred symbols and poetry as ally to the visual arts. The works have ranged from hanging the Confederate flag in Gettysburg (2004), to making a system of MathArt quilts with Amish quilters (2008) to the current planning of turning NYC into a clock, to organizing a 13-state burial of Confederate flag on Memorial Day 2015. 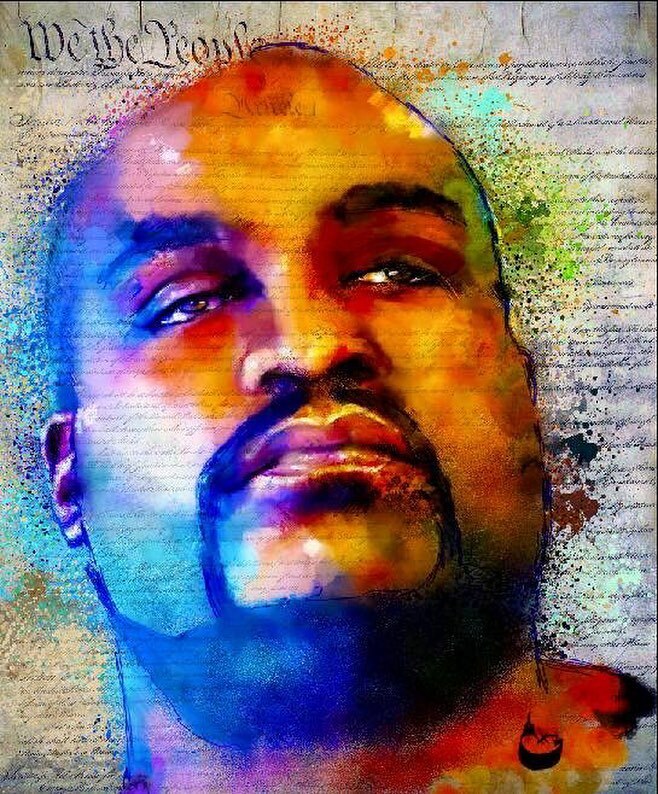 He is currently completing, Recoloration Proclamation, 16 year multi-media project featuring: an exhibition of recolored and hanging Confederate flags, a multi-state flag funerals, a play, a documentary film and a music project featuring 13 black versions of the song "Dixie." He has lectured and exhibited both nationally and internationally and his work has been featured in Art in America, Sculpture, Transition, FiberArts, Science News, CNN, NBC News, New York Times, USA Today, The Guardian, Wall Street Journal, Washington Post, The Root, The Rumpus, The Huffington Post, The Grio, and the science journal Nature. The Proper Way To Hang A Confederate Flag © John Sims, used with permission of the artist. If life were a photo, then my artwork would be its negative, seeking to explore those aspects in our society that have been ignored or forgotten such as history, lynching, misogyny, slavery and suicide. By printing these forgotten negatives, I give voice to the marginalized people and disregarded aspects of our society. For me art is my form of social work and I use it to open doorways to community dialog, which is the first step to healing, which in itself leads to wider social change. Although I draw inspiration from traditional African spiritual practices, folklore, current and historical events, my work is ultimately about community, healing and memory. Names of the Lynched Wallpaper © LaShawnda Crowe Storm, used with permission of the artist. Jason deCaires Taylor is a sculptor, environmentalist and professional underwater photographer. Born in 1974 to an English father and Guyanese mother, Taylor graduated from the London Institute of Arts in 1998 with a BA Honours in Sculpture. His permanent site-specific works span several continents and predominately explore submerged and tidal marine environments. His multi-disciplinarily sculptural works explore modern themes of conservation and environmental activism; Over the past 10 years Taylor he has created several large-scale underwater “Museums” and “Sculpture Parks”, with collections of over 850 life-size public works. A prolific sculptor, he became the first of a new generation of artists to shift the concepts of the Land art movement into the realm of the marine environment. He gained international notoriety in 2006 with the creation of the world’s first underwater sculpture park, situated off the west coast of Grenada in the West Indies. Now listed as one of the Top 25 Wonders of the World by National Geographic the park was instrumental in the government declaring the site a National Marine Protected Area. Vicissitudes, Granada © Jason deCaires Taylor, used with permission of the artist. Vicissitudes, Granada, Clean © Jason deCaires Taylor, used with permission of the artist. PLEASE, SAY HER NAME, is a painting of an African American Woman sitting in front of a quilt bearing the names of Black Women martyrs who unjustly lost their lives in the 21st Century. She is holding a colorful quilt bearing no names - which is her hope for the future. This painting was part of the 2017 Hoosier Women in Art Exhibition: Politics & Protest, at the Garfield Park Arts Center, Indianapolis, Indiana, and sponsored by the Indy Parks Department. Some of my artwork has been featured on CBS' "Criminal Minds," Season 10. Kara Walker's latest show, The Ecstasy of St. Kara, highlights connections between religion, slavery, martyrdom, and the use of lethal force by police, which has inspired protests nationwide. In the show's catalog, Walker says that controversial recent killings of black men by police represent a backlash, caused by deep-seated racial anxieties, against the election of Barack Obama as the nation's first black president. 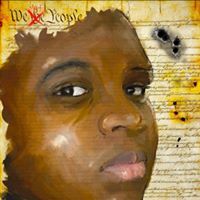 "I fear that Michael Brown and Tamir Rice and all the rest were killed as proxies for The Black President," Walker writes in her essay, entitled "Assassination by Proxy," published in the show's catalog. Nafis White works in sculpture, photography, video, collage, sound and performance exploring issues of identity, race, inequality, politics and landscape, using personal narratives to facilitate and build conversations with the viewer. Her approach is one that is heavily influenced by conceptualism as well as aesthetics and climate, both political and social, with much of her work currently centered around the New Civil Rights Movement in the United States. Nafis employs many different strategies in the way that she visualizes and then builds work, utilizing a multidisciplinary approach to her art making. White received her BFA in Sculpture with a Concentration in Art History from the Rhode Island School of Design before studying for her MFA at Goldsmiths University of London. Nafis currently lives and works in London, England. I bring together the rhythm of hand-dyed, painted and commercially-made fabrics with the syncopated lines of my quilting to tell stories about the African Diaspora and my community. While my textiles are steeped in the tradition of the story quilt, cloth-based narratives constructed frequently from scraps of clothing and other familiar fabrics to record history at a particular time and place, they are intended to be viewed on the wall rather than to dress a bed. My tales are for all to see and know, rather than for just an intimate few. I challenge the status quo, refusing to accept the stereotypes forced upon me by society. Instead, I question the very nature of these stereotypes using familiar forms and processes to hold the viewer’s attention. I created Miss Laura Fruit Tree in honor of Laura Nelson once LaShawnda (Crowe Storm) introduced me to her and her family. Miss Laura Fruit Tree made an appearance in Southside With You, the film about Barack and Michelle Obama's first date. Miss Laura Fruit Tree © Trish Williams, used with permission of the artist. Carletta Carrington Wilson's mixed-media collages have been described as "decorative with a message." 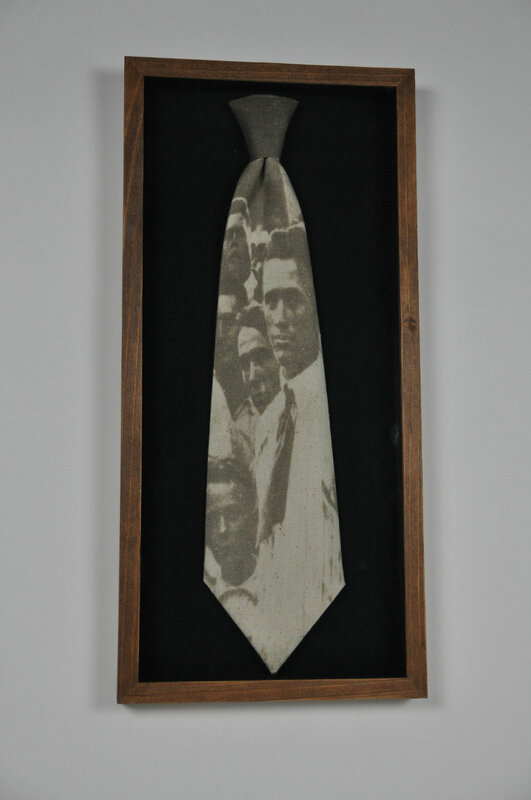 Textiles, found objects, beads and paper revolve around a central iconic image. These elements serve the purpose of enhancing, highlighting, inferring and interrogating the image and the ideas it presents and portrays. © Carletta Carrington Wilson, used with permission of the artist. WonderRoot is an arts organization that works to improve the cultural and social landscape of Atlanta through creative initiatives and community partnerships. The anchor of our organization is our Arts Center - a full-service facility that supports artists, offers public programming and brings diverse voices together to envision and activate a stronger Atlanta. We Gonna Be Alright © WonderRoot Center for Arts and Social Change, used with permission.